Pond is for the mainstream introduction to animal science taught in every university that has a school of agriculture or animal science department. The result of years of teaching, the book provides students with a comprehensive and balanced overview of animal agriculture in contemporary society, taking into account the needs of students with highly varied cultural backgrounds and educational objectives. Wilson G. Pond is the author of Introduction to Animal Science, published by Wiley. 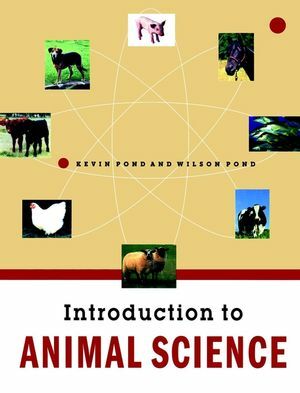 Kevin R. Pond is the author of Introduction to Animal Science, published by Wiley. Authoritative authorship. The authors are well-known, well-published and well-respected in the area of animal science. Organization. Emphasis is on five general areas of focus to meet the needs and interests of students whose cultural backgrounds and educational objectives are highly varied. Population and Food Supply. Addressed within the framework of how animal agriculture contributes to the overall human endeavor. Principle of animal biology as a science within the context of life-cycle production of animals for economic and biological efficiency. Addressed in order to provide a firm foundation for the study of the production of individual species of farm animals. Individual chapters devoted to the description and analysis of particular animal industries (i.e., dairy cattle, beef cattle, sheep and goats, swine, poultry, horses and aquatic animals, etc.). Evaluation of live animals and the marketing of animals is also discussed. The products of animal agriculture. Includes meat, milk, poultry, eggs, fish, fiber, and other products and by-products of the industry. A separate chapter on emerging issues in animal science. Societal issues have been covered throughout the text. The final chapter ties the production system and societal issues together. Text includes contributions from authors that are well recognized as experts in their respective areas of study. These contributors include: D.E. Ullrey, D.G. Sisler, S. P. Jackson, L. E. Chase, A. D. Herring, R. Ernst, D. Topliff, R. T. Lovell, D. Laflamme, J. Bernard, M. F. Miller, R. Bradley, A. Sams, D. E. Hogue, D. Buchanan, M. Thonney, A. Bell.